Carrillo's Pro A-beam rod design offers significant weight savings over stock connecting rods, while offering tremendous strength advantages. This translates into a more robust bottom-end for your high performance machine. 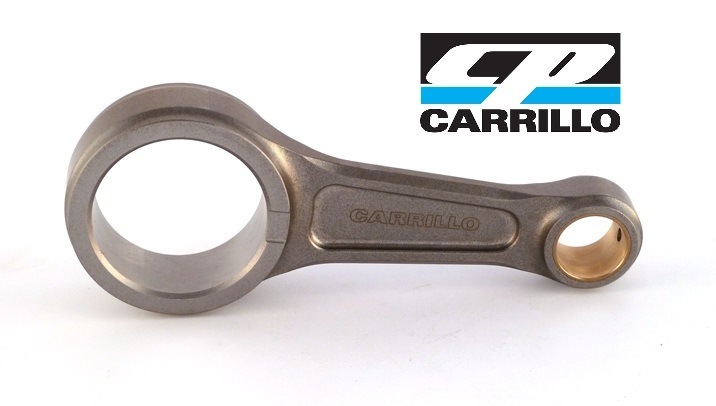 Strength and reliability are the hallmarks of Carrillo connecting rods - and a critical foundation for your performance goals. Carrillo uses a proprietary chrome, nickel, moly, vanadium alloy which meets all VAR (vacuum arc re-melt ASTM standards). The heat treatments are validated, both by the supplier and an independent metallurgist whom confirm the desired physical and chemical properties of steel.